What was the worst shark attack in history? According to a number of sources including the Discovery Channel, the worst shark attack in history occurred in July of 1945. After being hit by Japanese torpedoes, the U.S.S. Indianapolis Portland-class Cruiser sank in 12 minutes. The ship had just left Guam and was enroute to Leyte with 1196 crew on board. It is estimated that at least 300 men were killed when the ship went down, and the rest of the crew were forced to wait in the ocean for someone to rescue them. It is estimated that 800 men went into the water on July 30th, with very few lifeboats or life jackets. The men floated in the open sea hoping for a rescue, but unfortunately, the Navy was unaware that the ship had not reached its destination. Although the ship, according to some sources, had sent out distress signals, they were not acted upon. Three stations later reported that they heard the call. Sadly none of these stations, for a number of reasons, (including one station that thought it was a Japanese trick) did anything about the message. The port commander on Guam assumed that the ship had reached its destination because he had heard nothing and the port commander at Leyte removed the ship from the operations board because he had no news of the ship and assumed it had arrived on time. The second in command did not bother to investigate the ship’s non arrival and did not bother informing his superiors. The poor sailors left in the water had to wait for five days before two planes spotted them purely by luck, floating in the water. The survivors related terrifying tales of hearing men scream as they were attacked by sharks. Many of them saw their friends and shipmates simply disappear beneath the waves, or felt the brush of the huge fish as they circled and fed. Helpless and floating, in the open water, there was nothing for them to do but wait and pray. Of the approximately 800 men who went overboard, only 316 were rescued. Although some of the men did die from thirst, exposure and starvation, most were taken by sharks. Sadly, many did not die immediately by direct attacks, but rather suffered the terror of sharks continually taking pieces of them while in a feeding frenzy. The shark that is blamed for the atrocity is the whitetip shark. 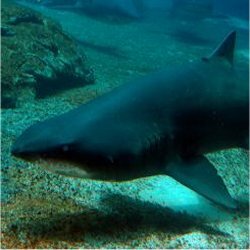 This entry was posted in Animal Trivia and tagged shark attack, shark attack facts, shark attack information, shark attack trivia, world's worst shark attack, world's worst shark attack trivia, worst shark attack by Jane. Bookmark the permalink.